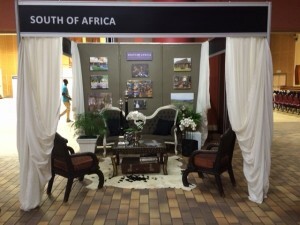 South of Africa attended the annual Funama Wedding Expo in Polokwane during the last weekend in March, showcasing our lovely Waterberg wedding venues. Following the success of the 2014 event, South of Africa returned to this great platform and met with many potential clients and interested couples. As a special add on, visitors to the stand were treated with a unique spa treatment provided by Essence of Youth, the on site Spa at Shangri-La. For more information about the wedding facilities of the four Limpopo venues (Shangri-La, Elephant Springs, Birdsong Cottages and Funky Stay), click here.